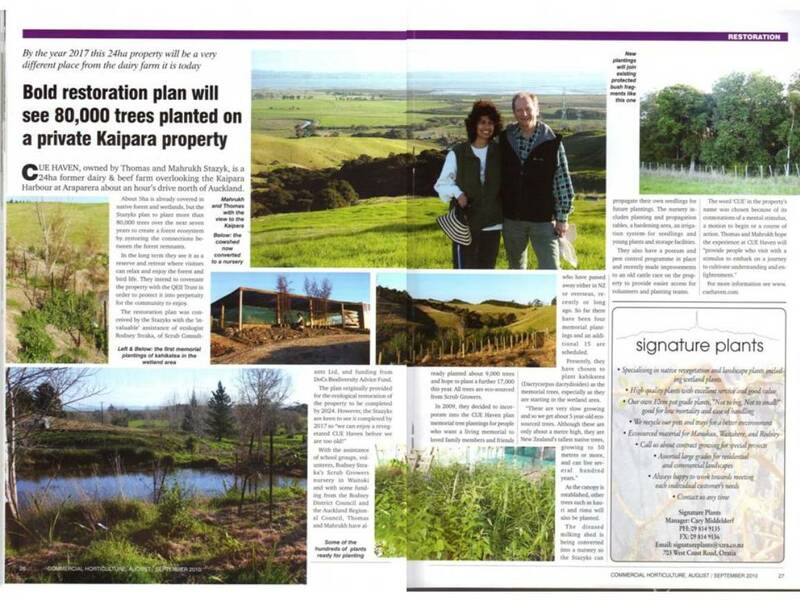 Landscape Architecture Aotearoa is published by the New Zealand Institute of Landscape Architects (NZILA) and in the current issue there is a great article about CUE Haven and how landscape architect and NZILA member Jeremy Parlane got our viewing platform project off to a great start. 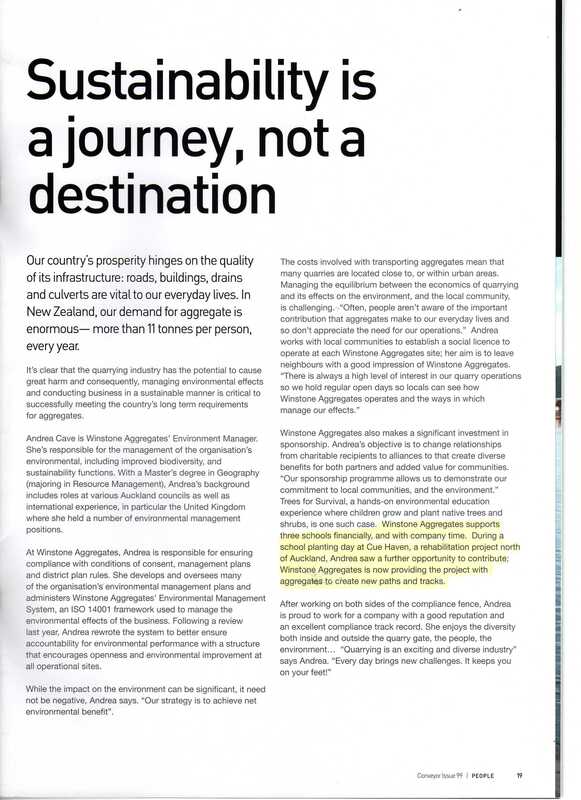 You can read a PDF version of the article here or on the Landscape Architecture Aotearoa site here. This week’s edition of the Rodney Times featured an article by Delwyn Dickey about the 150th Anniversary of the community of Glorit, where CUE Haven is located. 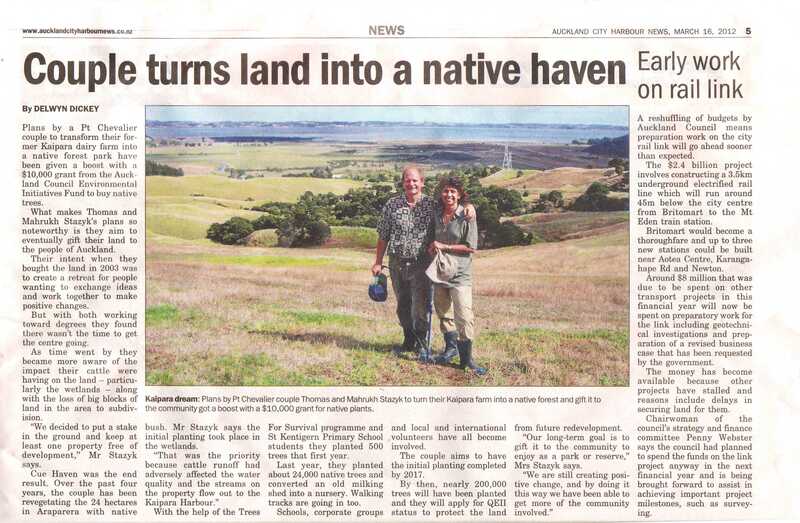 The article describes some of the history of the area and talks about CUE Haven and our neighbours at Mataia. You can read the article here. Since 2015, members of the Air New Zealand Greenteam, a group of dedicated Air New Zealand employees, have been coming to CUE Haven to help with planting. 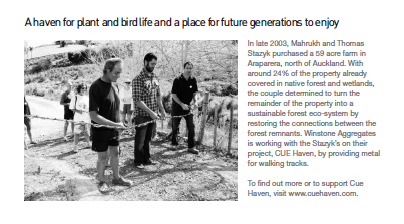 The contribution of the Greenteam and their involvement at CUE Haven was highlighted in a recent issue of Air New Zealand’s in flight magazine. That means that people travelling around the world had the chance to learn about the Greenteam and their support of CUE Haven. You can read the article here. In July, a group of students from Takapuna Grammar School spent a day planting at CUE Haven. 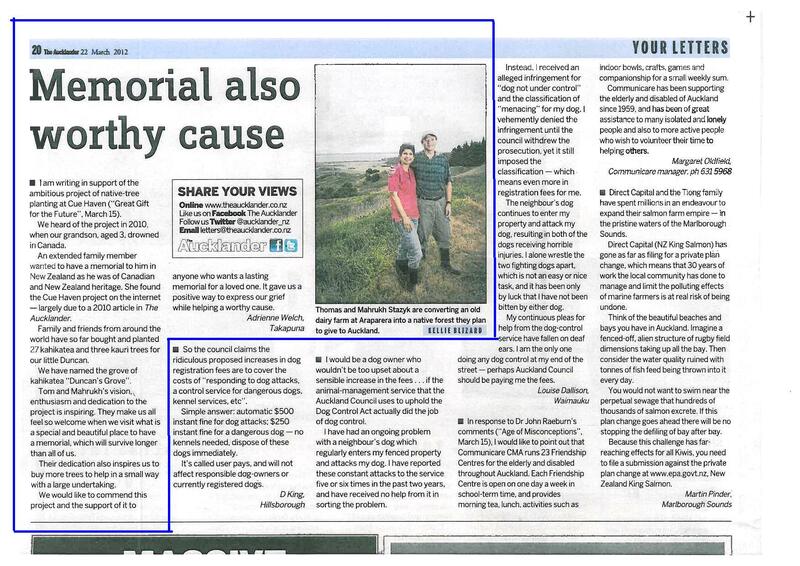 Their efforts were recognised in an article in the local newspaper, the Devonport Flagstaff and you can read the article here. Each year, the New Zealand Mental Health Foundation sponsors Mental Health Awareness Week to focus attention on mental health and well being. The Foundation sponsors activities around the country intended to promote well being and one of the themes is “Nature Is Key To Well Being.” The CUE Haven story has been included on the Foundation web site as a story about the link between nature and well being and you can read the story here. This week’s edition of the Rodney Times featured an article about the visit by Abingdon School. You can read the article by Delwyn Dicky here. Communication Studies at Unitec in Auckland are doing a project to assist CUE Haven in developing a community communications strategy and on 4 August 2015, the students visited CUE Haven to experience and learn more about the project. Several students put together a beautiful video summary of their visit and you can see it here. During 2014 – 2015, the Faculty of Creative Arts and Business at Unitec in Auckland sponsored a community media project called “The Spaces Between/The Living Community.” The project involved students and staff from the Departments of Communication Studies and Performing and Screen Arts. Six community projects in the Auckland area were identified and teams of students and staff created film documentaries on each of them. The documentaries were broadcast on the Auckland community television station, Face TV, during May and June 2015. We are honoured that CUE Haven was selected as one of the projects and you can see the documentary here. A journalist from the Rodney Valley Voice newspaper visited CUE Haven in November for our Conservation Week Open Day. You can read the article here. 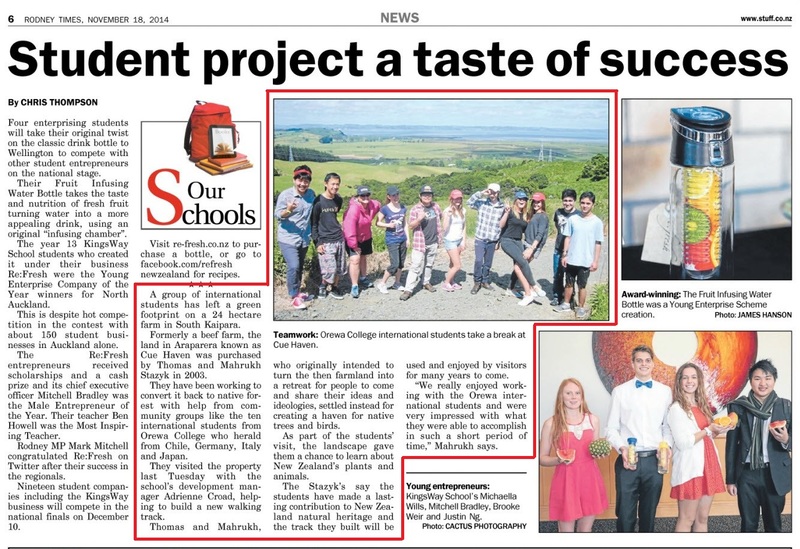 This week’s edition of the Rodney Times featured the visit by Orewa College Students. You can read the article here. As part of New Zealand Conservation Week, TV3 news paid us a visit while a group of volunteers from Westpac Bank were on site. You can see the news clip that aired on 8 November here. Honda New Zealand has supported CUE Haven from the very beginning through the Honda Tree Fund. 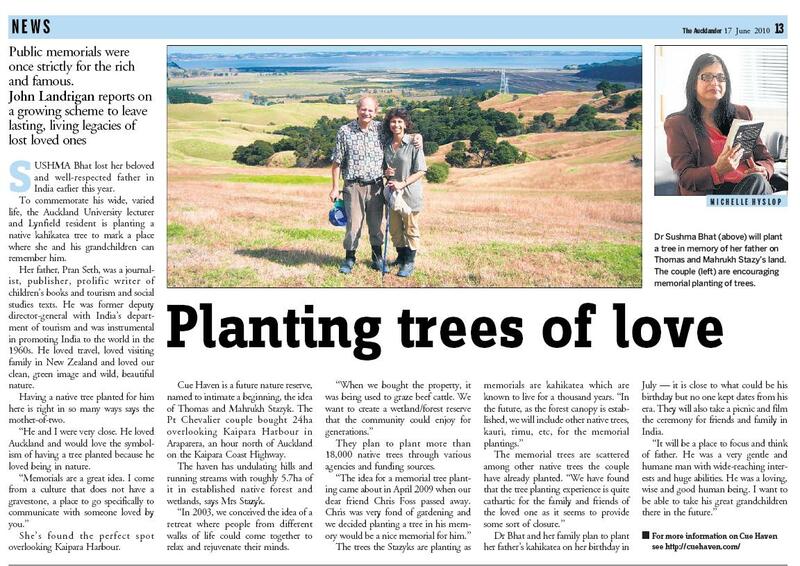 In 2012, Honda staff planted a golden totara to mark the sponsorship of the 500,000th tree by the Tree Fund and in June, 2013, a team of Honda people visited CUE Haven for a day of tree planting. Honda has made a video of the visit for their internal communications and shared a copy with us. You can view the video here. eVibe is the Auckland Council’s environmental education newsletter. Each edition features highlights of environmental activities taking place in the Auckland region and it is a great resource for teachers for classroom topics on the environment and also for volunteering and field trip opportunities. CUE Haven is very happy to have been featured in the current eVibe issue. You can read the newsletter in PDF format here. On 16 September, CUE Haven was featured on Radio New Zealand’s Spectrum Programme. Lisa Thompson of RNZ had joined us in July for the St. Kentigern TFS planting day and recorded the broadcast at that time. Click here to go to the Radio New Zealand web page where you can find a link to listen to the programme. 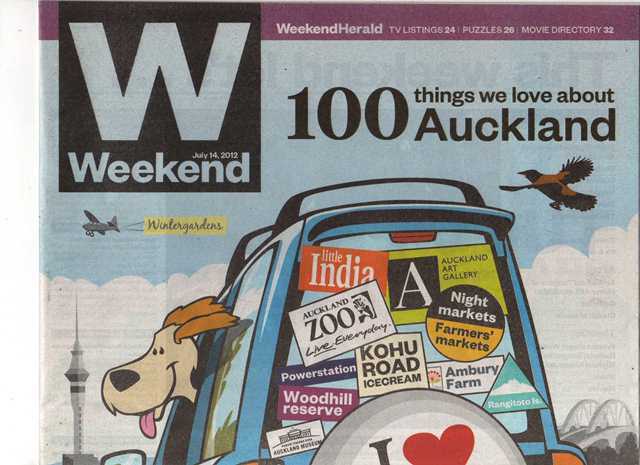 The July 14, 2012 edition of the Weekend Herald included a list of interesting attractions and features in Auckland and CUE Haven was included in the list! You can see the entire list here. CUE Haven is number 76. As a followup to the 16 March article in the Harbour News, Adrienne Welch wrote this beautiful letter about her experiences at CUE Haven. You can read the letter here. 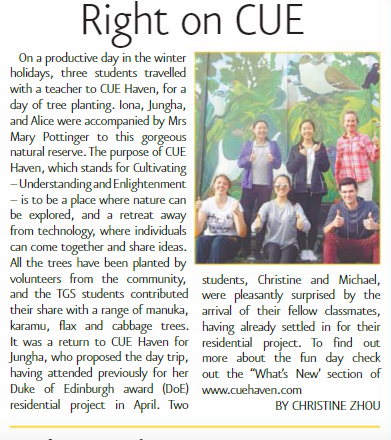 An update on activities at CUE Haven was featured in Auckland’s local newspaper. You can read the article in PDF format by clicking here. Aucklander Magazine is a weekly publication serving the greater Auckland area. Sophie Bond and Kellie Blizard of the Aucklander visited CUE Haven while we were working with a group of volunteers to build the walking track and reported on what they saw. You can read the article in PDF format by clicking here. CUE Haven recently received a grant from the Auckland Council Environmental Initiatives Fund. 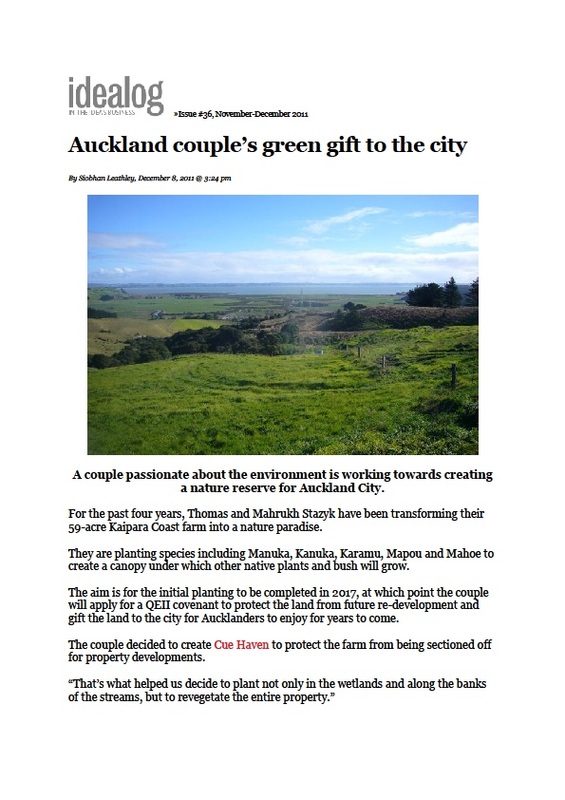 In order to publicise the CUE Haven project and the grant, the Auckland Council issued the press release below which was picked up by a number of on-line and print news services in New Zealand. You can read the release here. 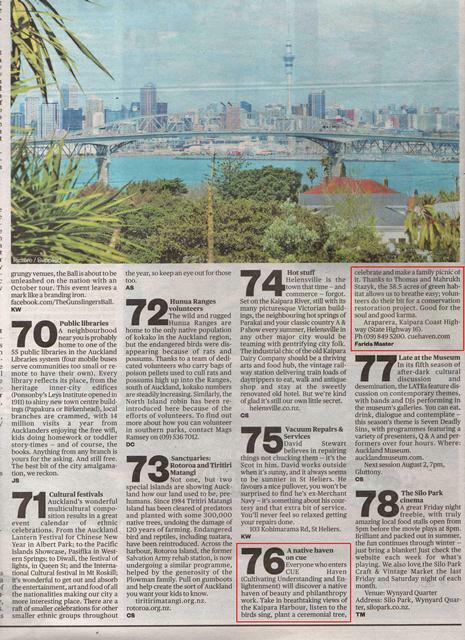 The release was also featured in the New Zealand Herald’s Elements Magazine and in Verve Magazine. Idealog Magazine is a New Zealand based business periodical focusing on the creative economy. It regularly features articles on leadership, technology, sustainability and design. CUE Haven is proud to be featured in the November/December 2011 issue. The article describes the CUE Haven project and the support we have received from the Honda Tree Fund. You can read the article here. Alternatively, you can click here to read a PDF copy of the article. We’d like to thank Donna Davies of Noodle and Esther Goh and Sioban Leathley of Idealog for making the article possible. Winstone Aggregates is New Zealand’s largest manufacturer of roading materials and they operate twenty-two quarries throughout New Zealand. They have been a great help to the CUE Haven project as we have built walking tracks and roads to enable visitors to enjoy the bush and to provide access for tree planting and maintenance. Lance Gosling, Manager of Winstone’s Flat Top Quarry, participated in the formal opening of the first walking tracks at CUE Haven in February 2011 and the company recently showcased his participation in their in-house magazine Quarry Talk. More recently, in their publication for customers, Conveyor, the company discussed the role of Andrea Cave, their Environment Manager. Andrea has been to CUE Haven to help on tree planting days and has also been our primary contact at Winstone Aggregates. You can read the Quarry Talk and Conveyor articles by clicking on the names of the magazines. We’d like to thank Winstone Aggregates again for their help and on going support. 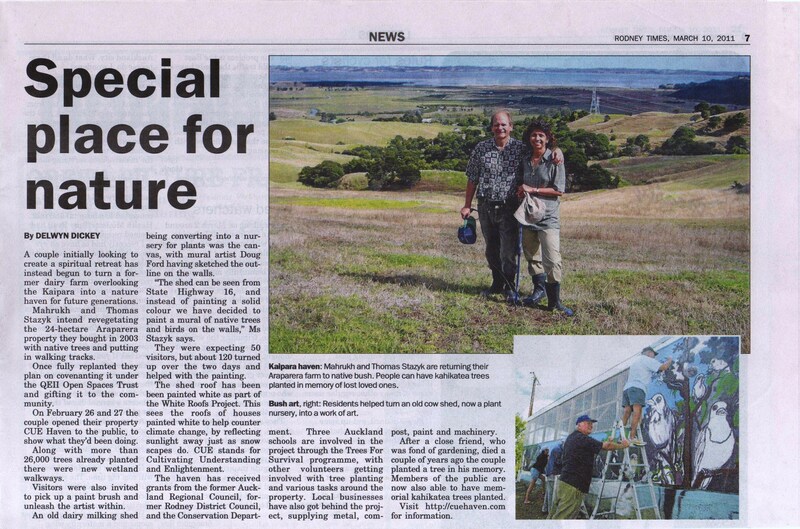 During the last weekend in February, over 120 people visted CUE Haven to explore the new walking tracks and to participate in the community mural painting on the exterior of the old dairy shed. The mural, featuring native New Zealand birds and vegetation, was designed by mural artist Doug Ford. Doug sketched the birds and plants and the volunteers painted in the details under Doug’s direction. We’d like to thank Delwyn Dickey of the Rodney Times for her wonderful article about the weekend. You can read the article here. Thomas is a Certified Fraud Examiner and is a member of the Association of Certified Fraud Examiners. The two founding members of the Fraud Examiner profession are Joseph T. Wells and the late Donald Cressey. 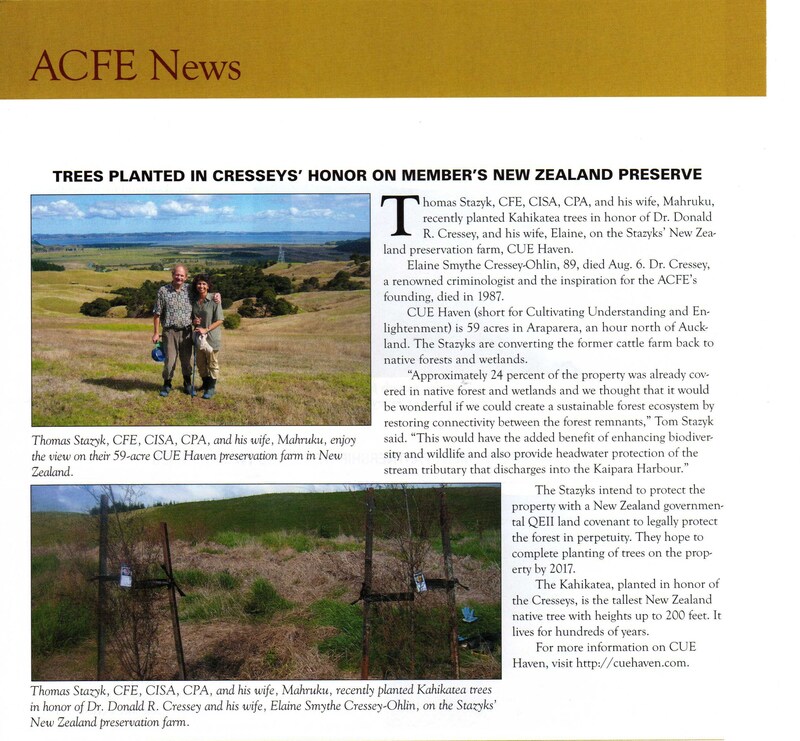 In September 2010, the ACFE sponsored the planting of memorial trees in remembrance of Dr. Cressey and his late wife, Elaine. Click here to read the related article in the ACFE magazine. The CUE Haven project was showcased in the August/September issue of Commercial Horticulture, a New Zealand based magazine for the nursery industry. We’d like to thank Kerry and Anna Johnstone for the time they took visiting CUE Haven and providing valuable feedback and encouragement. You can read the article below by clicking here. 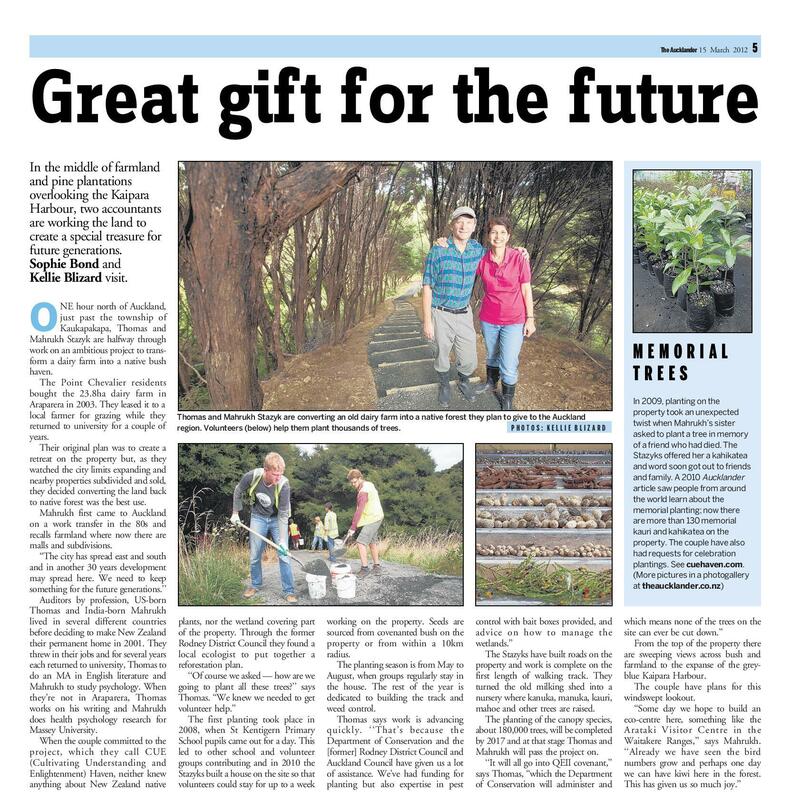 The Aucklander magazine has published an article about the memorial plantings at CUE Haven in their 17 June 2010 issue. You can read the article pictured below by clicking here.